This Fat-Free Raspberry Sorbet Recipe makes an amazing light sorbet using 2 pounds frozen raspberries. If you do not have an ice cream maker you can still make this delicious frozen raspberry dessert! Just follow the simple instructions below. In a pan, combine the water, sugar, and corn syrup, and heat on "low". Cook, stirring until the sugar is dissolved, about 4 minutes. Increase the heat to "high" and bring to a boil. 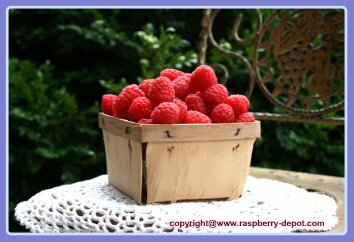 In a food processor or a blender, process the thawed raspberries, with the juice, until smooth. Strain the berry puree through a coarse mesh strainer to remove the seeds, or put the puree through a food mill to remove the seeds. Combine the berry puree and the cooled syrup in the blender and process until smooth. Pour into a bowl, and chill thoroughly. Transfer the berry mixture to an ice cream maker and follow the manufacturer's instructions for making sorbet. NOTE - If you do not have an ice cream maker, place the mixture in the freezer, and remove every 1/2 hour and stir with a fork or electric mixer till sorbet is firm frozen. (this should take about 2 to 4 hours). Yields 4 - 5 cups. Looking for ICE CREAM Recipes to make with Raspberries? I very happy with my purchase of an Ice Cream Maker Machine. I never knew making your own ice creams and sorbets was so simple ... almost like using a blender! The model I have is the Cuisinart, first one below, available online from *Amazon.com.